Community Action is at the forefront of activating the arts to address social justice issues. The growing roster of programming brings a range of social issues in the spotlight, with a focus on gender-based violence and its prevention. As a result, Gibney ignites dialogue, raises awareness, and forges long-lasting partnerships with community organizations. Check out what we’ve been up to this month below! Hands are for Holding is an in-school arts education assembly and residency program that inspires discussion and raises awareness around healthy relationships and bullying prevention. This month, Gibney’s Community Actionists facilitated12 assemblies in schools throughout the five boroughs. Hands are for Holding is offered in partnership with Day One and Mayor’s Office to End Domestic and Gender-Based Violence. Move to Move Beyond offers workshops in local domestic violence shelters using movement to empower survivors while on their journey to healthier futures. In March, Gibney offered 35 workshops in domestic violence shelters. Earlier this winter, we were excited to offer staff workshops to four new partners: Girls for Gender Equity, The Center for Anti-Violence Education, The Met Council and Arab-American Family Support Center. Moving Toward Justice offers initiatives to support and mobilize diverse artists as activists both on and off the stage, with generous support from the Bay and Paul Foundations. 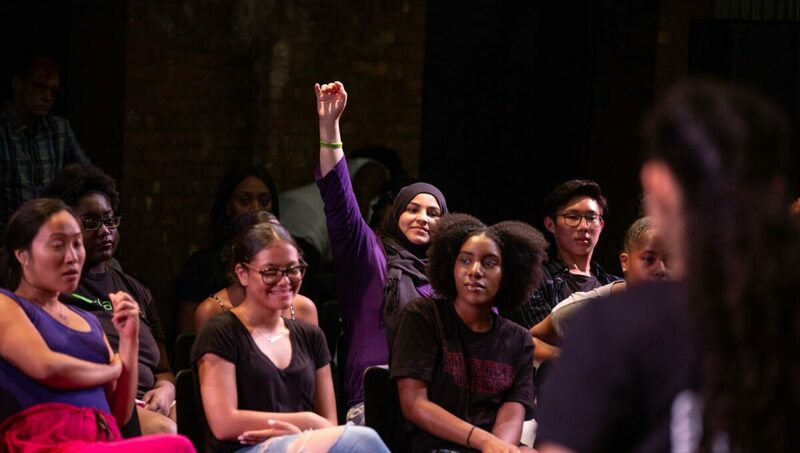 The Moving Toward Justice Cohort is a structured, 8-month program which provides six artists or collectives with mentorship, support, and a stipend for the development of an artistic project committed to activating social change. The members of the inaugural Moving Toward Justice Cohort are Nana Chinara, Parijat Desai, Kevin Gotkin, Kris Grey and Maya Ciarrocchi, Kayhan Irani, and Antonio Ramos. Join us for a celebration of food, performance, and stories at Immigrant Artistry: Home-Cooked. April 18 from 6:30-9:00 pm, as part of Gibney’s observance of Immigrant Artistry Week. Celebrate 20 years of Community Action at Gibney’s 2019 Gala: #MovementTransforms. May 9 at 6:30-9:00 pm. Applications are now available for the June 6-9 Institute for Community Action Training! Apply by April 25 to spend a weekend learning tools to start, build, and expand your own arts and social justice program. Save the date for the Moving Toward Justice Cohort’s Final Presentations, June 27 at 6:00 pm. Meet the artists and learn how their projects have developed over the course of the program. 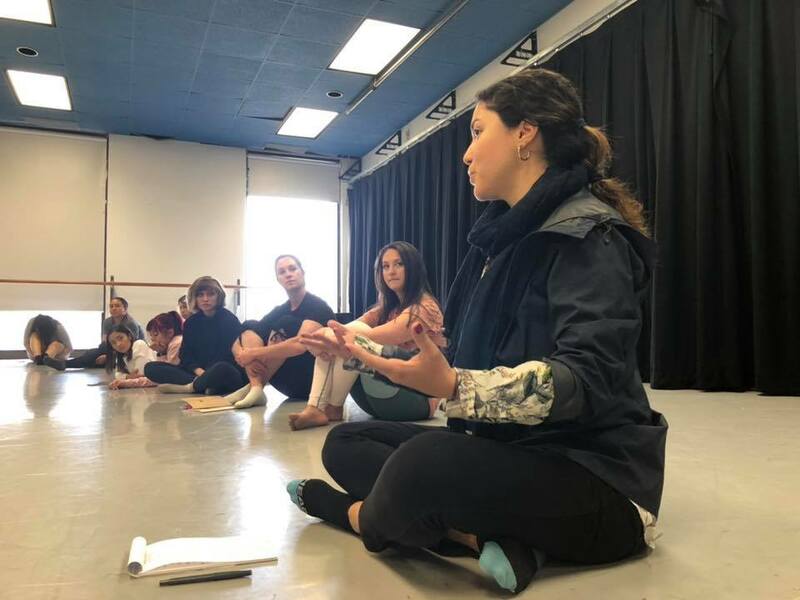 Director of Community Action, Yasemin Ozumerzifon, and Senior Company Director, Amy Miller, recently traveled to El Paso, Texas, near the border with Juárez, Mexico, to connect with local artists and activists across borders. They led workshops at the University of Texas, El Paso; Center of Hope, an organization dedicated to eradicating human trafficking; the El Paso library and more.